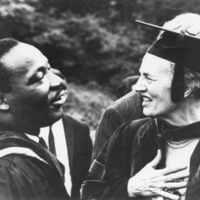 An image of Martin Luther King, Jr., and Katharine Elizabeth McBride, fourth president of Bryn Mawr College (1942-1970). Dr. King delivered the Baccalaureate Address for in 1966; this image was taken by a College staff photographer at that event. 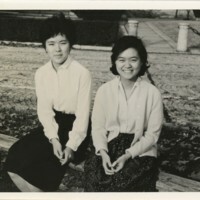 Frederica de Laguna, Bryn Mawr College class of 1927, pictured in 1962. Photographer unknown. 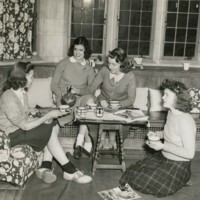 Students at tea in Rhoads dormitory, 1960s. Photographer unknown. 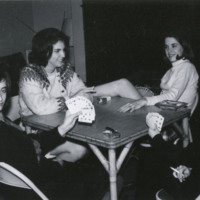 Photograph of four unidentified students sitting around a table and playing cards. 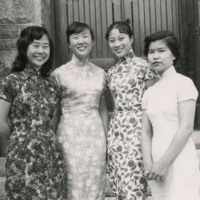 One of the students appears to be winking at the camera while the others are looking away. 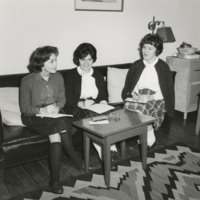 Photograph of three students, one of whom is identified as Lora McMeekin (Class of 1963). 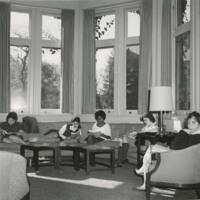 The students are seated around a table and a small ashtray is visible on the able along with a case of some sort. 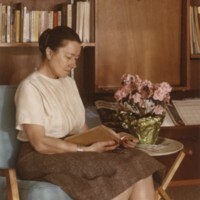 A lamp and a desk are visible in the background as well. May Jen, Julia Chang (both Class of 1960), Shirley Seung (Class of 1962) and Amy Cheng (Class of 1961) photographed standing together outside of a campus building. 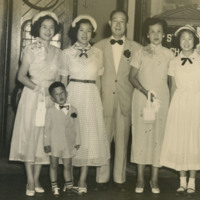 Julia Chang (Class of 1960) is pictured along with three other women, a man and a small child. This is possibly Julia (who is second from the left in the back row of the photo) with her family.